Race organizers say runners need to be ready to “get dirty on Diablo” when they climb the sometimes steep hills and valleys at the Diablo Summit Stomp, which takes runners up the slopes of Mount Diablo, which sits at an elevation of about 3,849 feet above sea level in the middle of California’s Mount Diablo State Park. 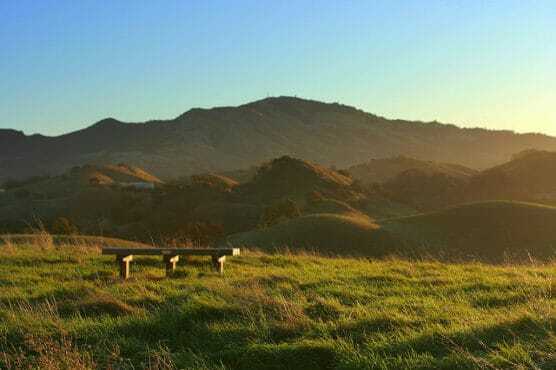 One of the San Francisco Bay area’s most beautiful parks, Mount Diablo is known for its distinctive rock formations and is filled with miles of trails for hiking, walking, horseback riding and camping. The race is billed also as the “Save Mount Diablo” race, to raise funds to help protect the environment here on the mountain and in the surrounding park area. The half marathon, 30K, 10K & 5K races share the same starting line at the Castle Rock Park area of the park, just off Castle Rock Road in the northwest corner of the park. From there, the course follows a course that takes runners southward and westward along the fire roads that lead through mountainous terrain, with plenty of water crossings and muddy and rocky areas, all the way up the slopes of Mount Diablo. The course follows an out-and-back loop route, and returns back to the starting line for the finish along Pine Ridge and through Pine Canyon. While there will be three aid stations set up along the course, runners are encouraged to carry their own water bottle or hydration pack, as this is a trail race and they will need to stay hydrated. Located in Northern California, just across the mountains beyond San Francisco Bay from the city by the same name, Walnut Creek typically experiences warm, dry summers and cooler, wetter autumn and winter seasons. On the day of the race (Nov. 2), the average low is 46°F and the average high is 67°F. See the race route map for the Diablo Summit Stomp Half Marathon here. To reserve your spot in the fall 2019 running of Walnut Creek’s Diablo Summit Stomp Half Marathon, 30K, 10K or 5K race, register online at RaceRoster.com here. Ever run in the Diablo Summit Stomp? Share your impressions here, or post your review in the Comments below.